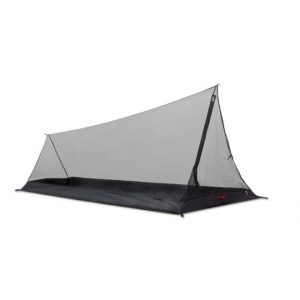 A good little net tent, but roomy enough for 1+gear or for two shoulder to shoulder. Needs external support—hiking poles or trees at the least, and must be staked out for proper pitching. 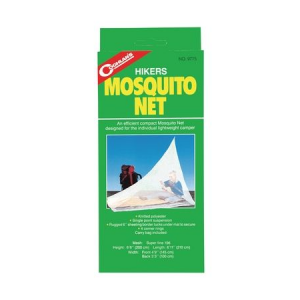 Net tent only; does not include tarp/rain fly. My main reasons for getting this tent was that I wanted to have a shelter that would allow me to set up the tarp first if it were raining. I have a hammock system that works the same way, and it's come in handy before. 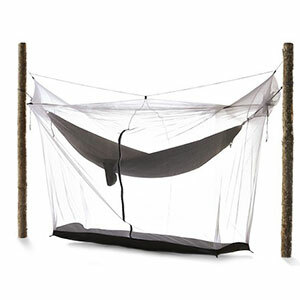 I already owned a hammocking tarp (Warbonnet Outdoors Superfly) to keep me dry and just needed a bug-free enclosure to hang beneath it. 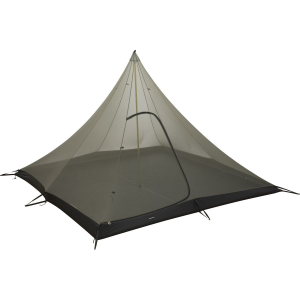 Bear Paw WD makes the Minimalist 2 Net Tent (and other products) to order, which means that you may have a bit of a wait, but also means that they are able to customize your items as needed. I opted for a long version of the tent, with a zipper (double pull) that extended halfway along one side, across the entire front, and halfway along the other side. This allows either occupant to climb in/out without disturbing the other, if used by two. In addition, the extended opening allows the tent to be "peeled" open if needed, allowing easier entrance/exit. With the extra fabric rolled up, one could sit inside the tent with your cooking gear just outside—easily in reach and without the tent fabric getting in the way. The tent does depend on fabric tension to keep it upright, so I noticed the sides got a little sag to the when the front was completely opened in this manner. Zipping closed restored the tension to the fabric. Besides this minor issue, the only other thing that's caught my eye is the fact that the six-cornered base only has four stake anchor points, leaving two corners without a means to keep them stretched taut. This isn't a big deal, in my opinion: the floorplan on the website is not quite to scale, and the angle of the two unstaked corners is very close to a straight line. I think it would have been good to have an option to pull all of the corners taut (for those of us who get a little OCD). Besides the zipper options, Bear Paw WD offers choices of bottom and end fabrics (both front and rear; silnylon ripstop, or cuben). The standard endcaps are mesh, and the bathtub sides come up 2.5" but can optionally be purchased as 8" sides (silnylon or cuben floors). 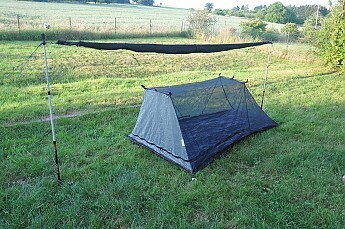 I opted for a silnylon front wall, as I planned to have that end of my tarp (Superfly) kept open, and the silnylon would still afford privacy. Besides these choices (available via the website their website), I contacted the company and asked to have some fabric gear loops sewed into the seams at key points on the inside, which they did without any problems. The Bear Paw has a video showing how to pitch the tent, but no written instructions. 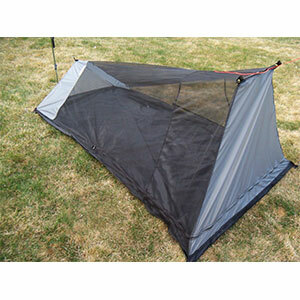 The video only shows how to set up the tent itself, and doesn't include instructions for combining it with a tarp. 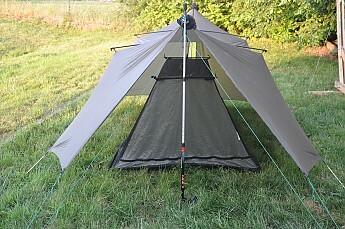 As such, I had to play around with the tent, tarp, and trekking poles a few times to come up with a system that works. 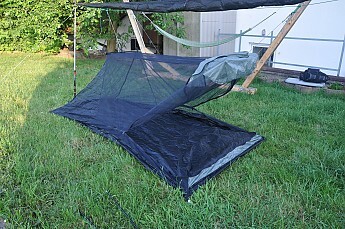 I'm now able to set everything up in about 20 minutes without getting anything wet but the tarp. My tarp is kept in homemade snakeskins, so if the weather is nice I can quickly stow the tarp and still have it ready to use on short notice. This would allow me to take advantage of the great visibility provided by the mesh walls and ceiling. The tent comes with a silnylon stuff sack and two Easton aluminum spreader bars (18" long when pitched; 9" long when packed) for the ceiling, to given more volume to the tent. Placing the bars is easy, but removing them takes a little finesse. They definitely increase the usable space within the tent, though. Using this solo, I had plenty of room for all of my gear, and still some room left over. 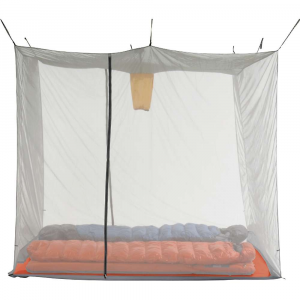 Don't expect a lot of additional features with this tent (unless you add them to your order)—as the name suggests, this is a minimalist tent; it will keep the bugs out, but that's about it. This job, it does very well. Besides backyard practice with the tent, I've only camped with it once. After 18 hours of driving to get to Intercamp 2015, I was able to get the tent set up in light rain, at 1 a.m., without any problems and without getting wet! At that time of night, I didn't notice that I had pitched somewhat close to an anthill. The ants spent plenty of time crawling over the outside, but I never had an issue inside the tent. Welcome to Trailspace, Graham! 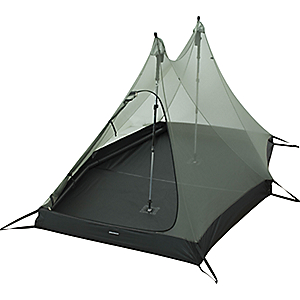 Thanks for sharing a helpful review of this BearPaw net tent. I'd love to see some pictures of your custom tent, if you're willing to add them to your review. I like the idea of a bigger bug net. I have trouble reading in mine at night since it's so puny. I think I can picture what you explained in your review. Could you post the weight too? I went to check out their site. Cool to see some smaller co. products. Nice pictures, Graham. Thanks for adding them. The BearPaw Wilderness Designs Minimalist 2 is not available from the stores we monitor.